Tall and broad and straight-forwardly handsome, Chris Evans looks like the model of American manhood. You could imagine him clenching a babe for a perfume ad or posing for a WWII propaganda poster pleading “Loose lips sink ships.” (In truth, he's done one of the two.) But though he's playing the most earnest hero to hit Hollywood screens—the do-gooder Steve Rogers, aka Captain America, who even he admits is corny—Evans himself is a slippery jokester, an about-to-be star cautious of the fame machine. After all, his dad is still a practicing dentist. Evans sat down with Boxoffice to talk about talking himself into the role, stripping some of the “Golly gee!” from the Cap, and how his character fits into The Avengers script. How does it feel to be chosen from hundreds of actors to be the perfect American man? Whoa! [Laughs] It's nerve-wracking, it's nerve-wracking. A movie like this comes with a lot of responsibility. There's a lot of people who love this comic book and grew up with it and want to make sure we do it justice. You turned the role down twice. After your second no, did you even imagine they'd ask you again? It was funny. I said no the first time. And then I went and met with Kevin [Feige, president of production for Marvel] and Joe [Johnston, director]. Meeting them had the desired effect. They were exciting and they were incredibly smart people. And if the movie was just a one-shot deal, if it existed in a vacuum, I would have done it no question. The problem is it's this giant commitment. And I walked out, called my agent and said, "It was a great meeting. And I'm still going to say no." He was furious—he was not happy. He couldn't understand why. But we said, "Thanks, but no thanks." And then they called back again and they had another offer and I said, "Well, let me take the weekend to think about this." I thought about it over the weekend and it just started to make sense. The fact that I was saying no because I was scared. I was scared because the good thing about movies is anytime you want to stop, you can. There's no obligation. I struggle sometimes with press and loss of anonymity. I don't really like being recognized, I don't like taking pictures. I'm kind of a private person in my own life. And if I ever had a movie that hit big—that was huge—and all of a sudden I was getting a lot of attention, I could step back if I wanted to. The problem with this is that if Captain America, this first one, came out big and I lost the privacy that I value so much, I wouldn't be able to step back. I have to continue—you have to make six of them—and that was terrifying to me. And the reason why it was so scary roots in insecurity. I mean, how bad is press? What's the worst that's going to happen? I could take out a knife. That could happen. Please don't. [Laughs] But taking pictures, signing autographs, making a kid's day—there's so many good things about it, it was upsetting that I struggled so much. And the reason I struggled was rooted in insecurity. Some way, some how, insecurity. I started to say, "Chris, you're not taking this movie because you're scared. And you can't let that insecurity and that fear dictate your choices because that's the stuff you're really going to regret—that's the stuff you're going to look back on in 10 years and say, "Man, I walked away from a great opportunity because I was scared." When you're scared of something, that's exactly what you should be doing. And all of a sudden it was like, "Alright, let's face this." And it felt good. I still felt scared, but I felt happy that I was going to be brave, happy that I'm going to try to take this on. Almost like Steve Rogers, you were enlisting in this machine. There were some great parallels in the film. You've got this guy who all of a sudden has this great gift. And he's kind of apprehensive about the possibilities, he's adjusting to the attention. It was some nice parallels to draw from my personal experience. But at the same time, he's from a different age that's, well, corny. I was okay with letting him be like that. The initial script had a lot more, "Aw, swell!" and "C'mon fella!" and, "Hey, bucko!" And I was like, "We get it. It's the '40s. Let's not beat it over the head." But I did like that it had a '40s feel—that he's there to help the cause. That's his charm and I think it makes for a nice contrast at the end of the film when he wakes up in a radically different world. In the modern world. I'm going to use that exact phrase from now on. Do it. But you have to use my trademark. Ha! Is that it flips the tables. Instead of putting Hayley Atwell in a bikini, the camera pans up and down and serves you like beefcake. [Laughs] I'm glad it's on film! At least I can say to my future kids, "Look, there was a time when dad worked out." It's necessary. That's the way you've got to look at it. It had to happen, it had to be that way, it lent itself to the character and it is what it is. How are you competing to look as strong as Chris Hemsworth's Thor in The Avengers? There's no competition. Hemsworth is a monster. Have you met him? I'm surprised he didn't break the phone in his hand. He's a god! He really is a god. You look at the guy and you're just like, "Man, take a day off. Take a break." You can't keep up. You have to accept the fact that Thor is supposed to be enormous. Captain America can be big, but Thor is supposed to be gigantic. There's no competition. In the Avengers team, what do you add to the mix? Well, I can't give away too much of the plot, but everyone is there ... not against their will, but everyone has a little bit of conflict. But there is a job that needs to be done and Steve is ready to do the job that's needed of him. I think Steve's a pretty selfless guy. Even though he has his own conflict with the world around him and trying to wrap his head around the fact that everyone he knew is gone, he's called upon and he responds and he puts himself last. Whereas I think everyone else has their own personal conflict which may throughout the film may prevent them from the job at hand. I think at the beginning, some put themselves first and Steve's M.O. is to put himself last. Do you have any friends of family who went through the military? Did they tell you about the loyalty and commitment? I have some friends who were in Iraq. Right now, actually. But I never got to discuss it with them. 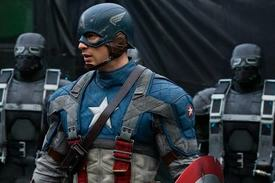 I have one buddy who I kind of grew up with who I would use as a homebase for Steve Rogers. This kid name Charlie who's just a good, good man. He always tries to do the right thing—he doesn't even tell white lies. He's just honest and helpful and he doesn't do it for people to notice or for praise. He just does it. If he was the last guy in the world, he'd still do the right thing just because it's the right thing to do. That's great that people like him even exist. I would throughout the day just say, "What would Charlie do?" And then use that for Steve. If you have nephews or know little kids, it must be cool for them to see your face on this poster. When I was struggling with the role, I thought, "There's so many good things I could do with a film like this." There's so many good things that come with a film like this—it's such a positive message. It's a guy who had nothing, but just by being a good man was afforded everything. And even once he had everything, he stayed a good man. He's not a bully and he defends the weak and he's just got character and values. There's so many good pieces to this puzzle, it was upsetting to me that I was hesitant at first because I do have nephews and little cousins who can look up to me in that sense. And that's something special in this business.